I know the Dodgers don’t have Justin Turner right now, and I know Justin Turner is one of the best pure hitters in baseball. As such, the Dodgers are playing at less than 100%, but that still doesn’t make them bad. It certainly shouldn’t make them as bad as Patrick Corbin made them look on Wednesday. Corbin was good for 7.1 scoreless innings, and he racked up a career-high 12 strikeouts. He also allowed only one hit, a blooper to shallow right field. Corbin actually managed to out-hit the Dodgers all by himself on the evening, knocking a single and a double. Corbin performed as well as he ever has, and the Diamondbacks stretched their early lead over the Dodgers to 3.5 games. Everything counts, no matter how early it is in the season. It should come as no surprise that, on a day Corbin proved nearly unhittable, he made great use of his best pitch. Of Corbin’s 12 strikeouts, he picked up a career-high ten of them with his slider. Corbin has always had a terrific slider — it’s the pitch that’s allowed him to be a big-leaguer. But he might only now be fully embracing it. The Dodgers just saw the new Patrick Corbin, and he’s a pitcher who’s decided to pitch to his strengths. The headline gives away part of the story. What do we know about Lance McCullers? McCullers loves to throw his curveball. McCullers doesn’t care about trying to establish the heater. His curveball is the best pitch he has, so, he throws the curveball more than anybody. You already know where this is going, at least in part, but, hell, you’re already here. Hear me out! Everyone has their own story of growth. 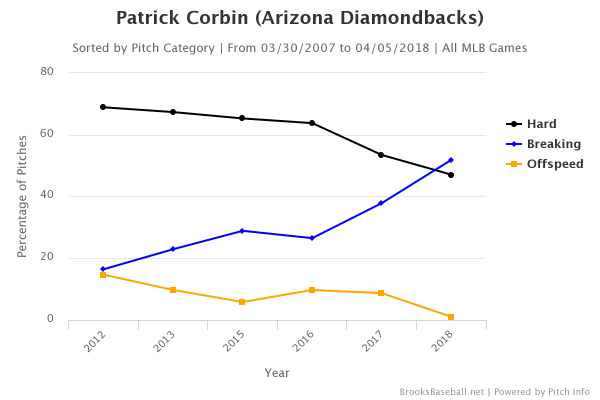 Patrick Corbin has pitched in the majors since 2012. Along the way, he’s thrown fastballs, sliders, and changeups. Used to be, he threw fastballs the overwhelming majority of the time. Not so anymore. Let me give you some information. I looked at starting pitchers who threw at least 500 innings between 2012 and 2017. I examined pitch-type run values on a per-200-innings basis. Over that time, Corbin’s fastball ranked in the 9th percentile. His changeup ranked in the 1st percentile. His slider ranked in the 79th percentile. I know that pitch-type run values aren’t perfect, and I know that every pitch works together, but the picture couldn’t be more clear. Corbin probably hadn’t been throwing enough sliders. He’d probably been throwing too much other stuff. It’s 2018. Fastballs are falling out of fashion. Especially bad fastballs. Why not change it up? Corbin has started two games in the young season. Too few to know anything for sure, but enough to show some indicators. He’s faced 48 batters, and he’s struck out 20 of them, with only two walks. Here’s a plot from Brooks Baseball. In Corbin’s first start, Statcast recorded 46 fastballs and 45 sliders. In his second start, against the Dodgers, Statcast recorded 43 fastballs, 53 sliders, and two changeups. Corbin’s early slider rate stands above 50%. Last year’s highest slider rate for a starter with at least 100 innings was 44%, belonging to Chris Archer. McCullers’ curveball rate was 47%. Corbin seemingly started this process last season, but now he’s only ramping it up. The fastball was never real good, and neither was the changeup, so, well, why use them so much? Who cares about baseball tradition, anyway? It would be one thing if that’s where the story stopped. Pitcher with one good pitch makes greater use of said one pitch. But Corbin is also working to introduce a new tweak. Here’s another Brooks Baseball plot, isolating the Wednesday start against the Dodgers. 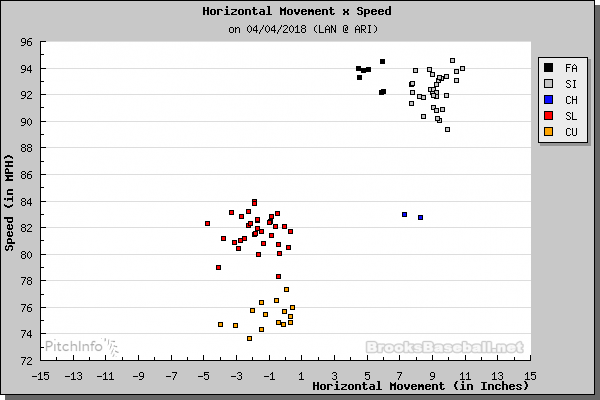 That’s a plot of speed vs. horizontal movement. You see that there are different labels for the pitches in the lower middle — the faster ones are considered sliders, and the slower ones are considered curveballs. In reality, Corbin was throwing the same pitch, with more or less the same arm action and movement. The idea is to vary the speed on the slider. Rich Hill does it with his curve. Lance McCullers does it with his curve. Corbin is learning to do it with his slider. I calculated his year-to-year slider velocity standard deviations. That’s a significant change in the early season. And, going start by start, in Corbin’s first outing his slider velocity standard deviation was 2.3. Against the Dodgers, it was 3.2. Corbin is effectively turning one pitch into two pitches, or a spectrum of pitches, depending on how you look at these things. If it seems easier to prepare for his slider if he’s throwing it more, this is a way to compensate for that. You might guess that Corbin is about to throw a slider, but his own slider kind of has a changeup and fastball variety. It’s common for a pitcher to throw harder with two strikes. But, before, Corbin had a range of 1.9 miles per hour. Right now, his 2018 range is 4.4 miles per hour. There’s a slider he’s more willing to throw for a called strike, and there’s a slider he uses to get a swing and miss. With Grandal hoping to drill a heater, Corbin found the zone with a slider at 75. That got Corbin part of the way back in the count. The next pitch was the same, and yet very different. Another called-strike slider, but this time at 82. That’s a 7mph difference between consecutive pitches. Suddenly, Corbin found himself at 2-and-2. Grandal had seen two breaking balls back-to-back, and they were up. Corbin went to his true specialty: the back-foot putaway slider. That’s the best slider. That’s the best variation of the pitch. And, that’s the pitch the Dodgers couldn’t handle. At the same time, Corbin can’t only throw back-foot sliders, because he’d get in too much trouble when he’s behind in the count, and the hitters shrink their zones. Corbin used to throw more fastballs, but his fastballs aren’t great. And Corbin used to throw more changeups, but his changeups kept getting hit around. And so we’ve gotten to here, with Corbin attempting something new: different versions of the slider, to help one play off of the next. Corbin’s best pitch has always been his slider, so why not fold in an offspeed variety? The changeup just wasn’t going to work. The slider very well might. It’s like two or three sliders in one. I don’t know what this’ll mean for Corbin’s long-term performance, nor do I know what it’ll mean for his health. He’s already missed one full season after elbow surgery, and that’s an ever-present concern. Since this is Corbin’s contract year, I’m sure he’d like to get through the season healthy. I’m also sure he’d like to get through the season good. And, it seems to me, this approach gives Corbin the best chance of being good in any given game. Patrick Corbin has improved his best pitch, and he’s also throwing it more, at the expense of inferior pitches. When you put it that way, how could it not work? We hoped you liked reading Patrick Corbin Is McCullersing by Jeff Sullivan! Is it just me (or the gifs), but is he slightly telegraphing which speed it is through a clear slow down of his throwing arm? Slider number one is definitely slower arm speed. It’s not uncommon for pitchers behind 2-0 to “bear down”, to make sure the pitch is a strike. On the next slider, the catcher sets up inside, but he misses the spot. He got away with one there. Also, the shape of the first one really looks like a curveball.